Worries about excessive bank lending to households are (understandably) never far from the headlines, but there is too little concern about the very low levels of lending to firms. The point of departure is a speech by Alex Brazier of the Bank of England, who examined in some detail the household story. According to his Star Wars allusion: “I’ll ask whether … the galaxy can be a safer place thanks to the Return of the Regulator”. 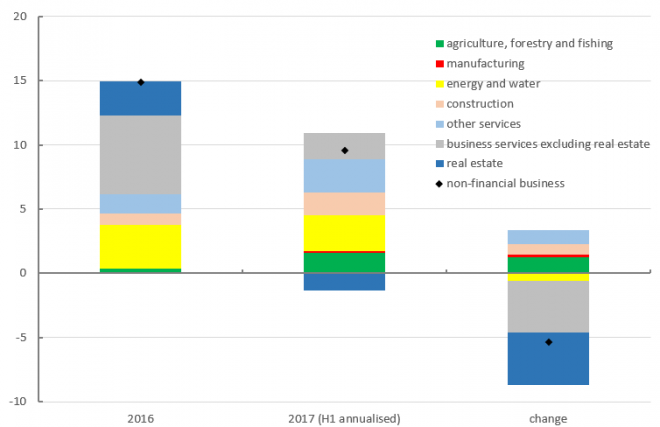 Newly issued Bank of England data is then used to examine the position for non-financial and financial firms in addition to that for households. A New Hope for the galaxy seems a way off. The TUC has discussed this subject at some length (most recently). The question here is whether lending to firms might be too cold – seemingly simple math when household lending is too hot and overall lending to the real economy is at the right temperature. On Monday the Bank issued figures that permit a closer look at the overall position. ‘Bankstats’ now goes to June and so covers the first half of 2017, and this can be compared with previous calendar years (as in my previous post on the subject) simply by multiplying the half year position by two (there are caveats below). The first chart looks at lending by sector (with households split between mortgage and consumer credit). 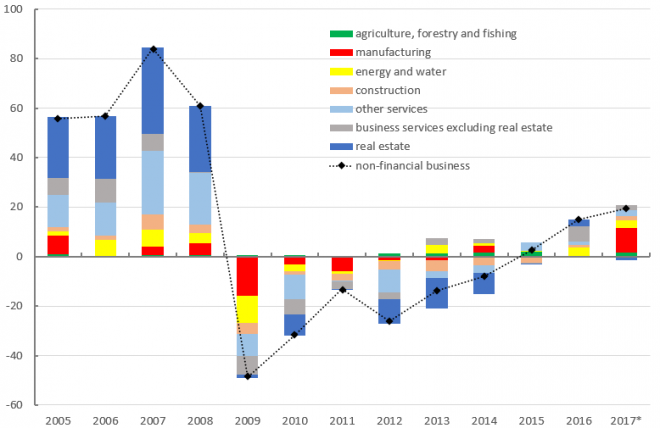 Each column reflects net lending (i.e. 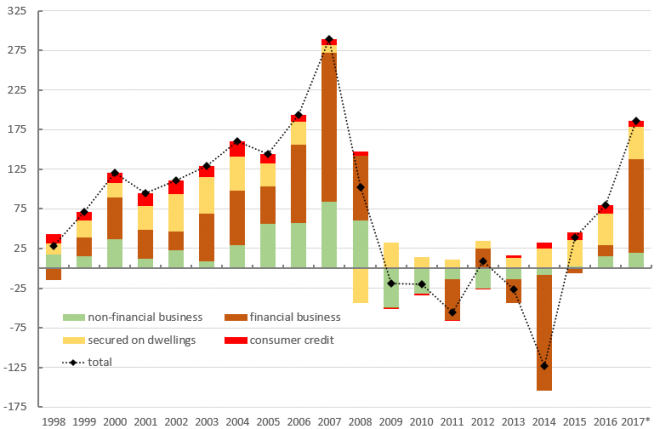 new lending minus repayments), and therefore the annual change in the total stock of lending. Overall, the projected position for 2017 shows lending positive across the board for the second year in a row. There is a big increase over 2016 (by just over £100bn), but this is accounted for by lending to the financial sector. While this might be alarming in its own right, there are caveats addressed in section 4 below. Within households, mortgage lending is proceeding at almost exactly the same pace as last year; consumer credit has come off a little. 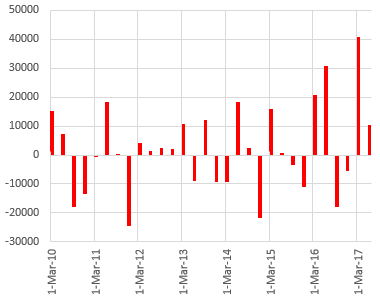 Net lending to business is moderately positive for the third year in a row, after six negative years. The increase on the year is likely to be spurious though – discussed further in section 3. Total net lending to businesses is projected at £20bn for 2017, up £5bn from £15bn in 2016. And at face value the strongest year since the financial crisis. There is, however, a big ‘but’. Updating the analysis over time results in the chart below. The strength on the year is explained by (unprecedentedly) strong lending to the manufacturing sector. 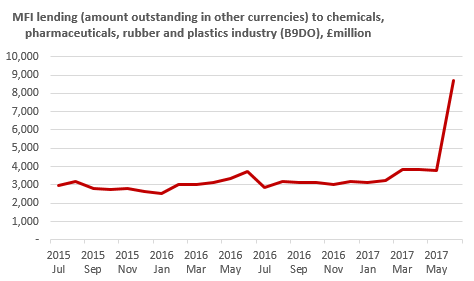 But looking deeper into the figures shows manufacturing lending little changed on the year except for a £5bn surge in foreign currency lending to the chemical industry in June – which looks like some kind of financial engineering. Adjusting this movement out (which amounts to £10bn on the year as a whole), gives the position for 2016, 2017 and the change between the two years shown on the next chart. While lending is still up (by £9bn), it is up by less than in 2016 (£15bn). Lending to real estate is back in negative territory, which echoes worries about slowing activity in the commercial real estate market outlined in the Bank’s latest Financial Stability Review (pp. 8-11). Then the increase in lending to business services is down significantly on the increase last year. Lending to construction and other services accelerated and UK banks’ and building societies’ remarkable largesse to agriculture continues. Firms are also able to borrow from other sources, notably capital markets. My earlier assessment is updated in the chart blow, with 2017 so far coming in a little down on 2016. 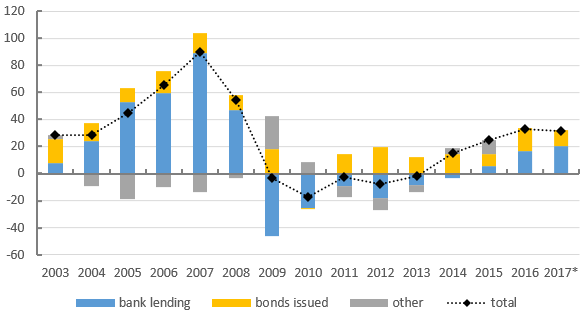 While corporate bonds (yellow) are taking up the majority of the slack, the issuance falls far short of compensating for the shortfall in bank lending to the real economy. Deciphering the different flows of money to the financial sector is tricky. The next chart gives the breakdown according to the main categories in bankstats. 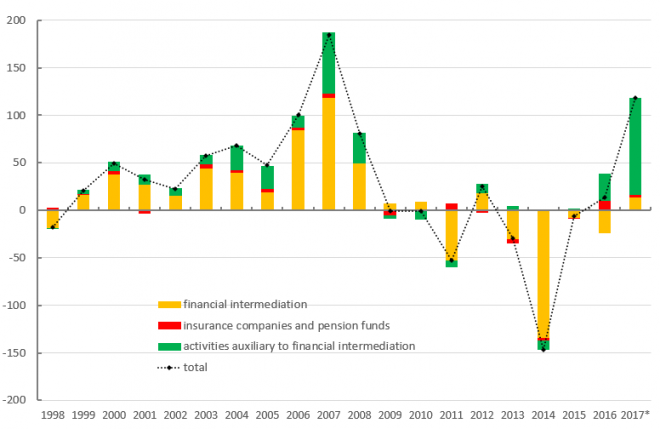 The strength overall is dominated by lending to ‘activities auxiliary to financial intermediation’ (e.g. securitisation special purpose vehicles and fund management), with lending to ‘financial intermediation’ itself still subdued. At face value the former is heading for a record. But there is a seasonal factor here. The below chart shows a tendency in a number of years for an extension of lending in the first half of the year and then repayment in the second half. So it may be that my estimate for 2017 (based on the first half of the year) is excessive. There may still however be growth in this form of lending, given the strong figure for 2016 – £28bn, the third largest on record, and dwarfing lending to non-financial business. This is detailed stuff and relies on a projection for the year as a whole that makes the figures merely indicative. 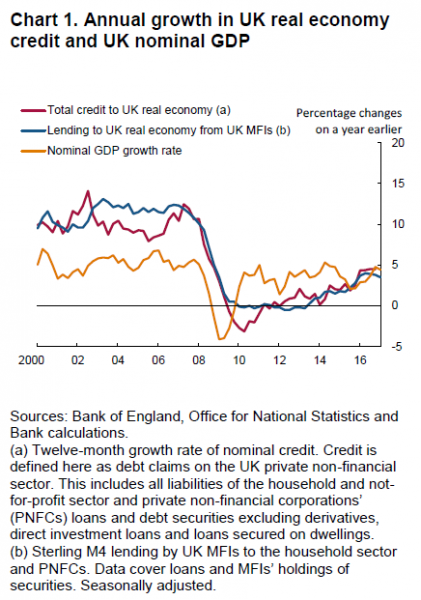 But the analysis offers a view of where bank lending into the real economy stands. To return to the Bank’s preferred allusion … The darkest days of the empire may have passed, but order has not been restored to the galaxy. The Jedi at the Bank of England are rightly worried about increased consumer borrowing in the middle of a living standards crisis. But there can be no New Hope without a strong economy, and with lending to business still severely restricted, worried should we be.